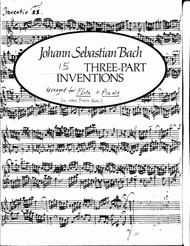 Originally for keyboard alone.This transcription extracted the top voice of the three parts and prints itseparately to be played by a flute or other treble instrument. The accompanying piano part playing the lower2 voices is available separately. In addition, an audio cd has been made wherethe flute is in the right channel, and the piano accompaniment in the leftchannel. This cd is useful as a practice tool to let eitherplayer practice with a recording. Allare in the original key. Violins and clarinets can play Sinfonia 15 in the original key of B minor, but theflute range doesn’t go low enough. 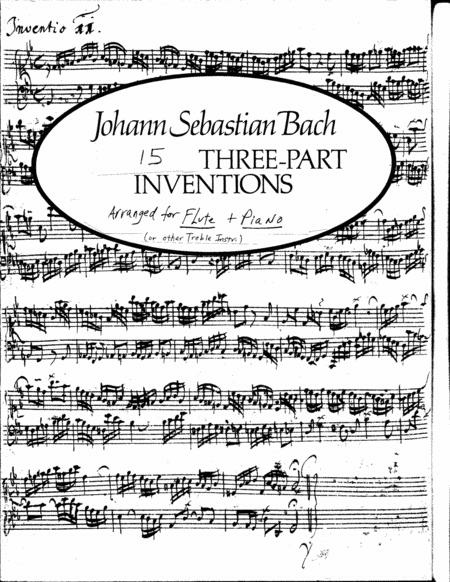 So Sinfonia15 has an additional version transposed to E minor so that a flute can play thelow notes of the melody linewithout jumping octaves. keyboard with transposing capability (which are readily available).